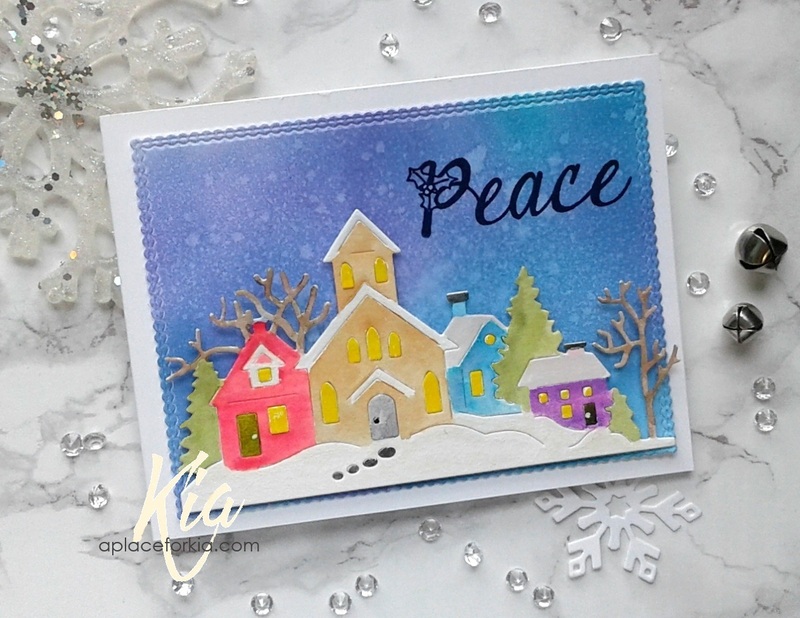 I have this sweet little hedgehog to share with you today which I did as my sample for the Clean and Simple Challenge at Splitcoaststampers called "Not a Creature was Stirring". For my card ... I kept it white except for the pops of colour on the image and for the sentiment. This little fellow is exhausted after all the fun in the snow and is catching a nap! I die cute the circle first and was going to stamp some birch trees, but I did not like that look, so I opted for white die cut birch trees which I attached on foam dots, as is the circle. I cut down one of the trees so the branches would flow in to my circle. I stamped the hedgehog and coloured with Zig Brushes then ran him through my ScanNCut to cut out, then propped him up on the circle, also with foam dots. I stamped the sentiment, then added a few sequins to finish. 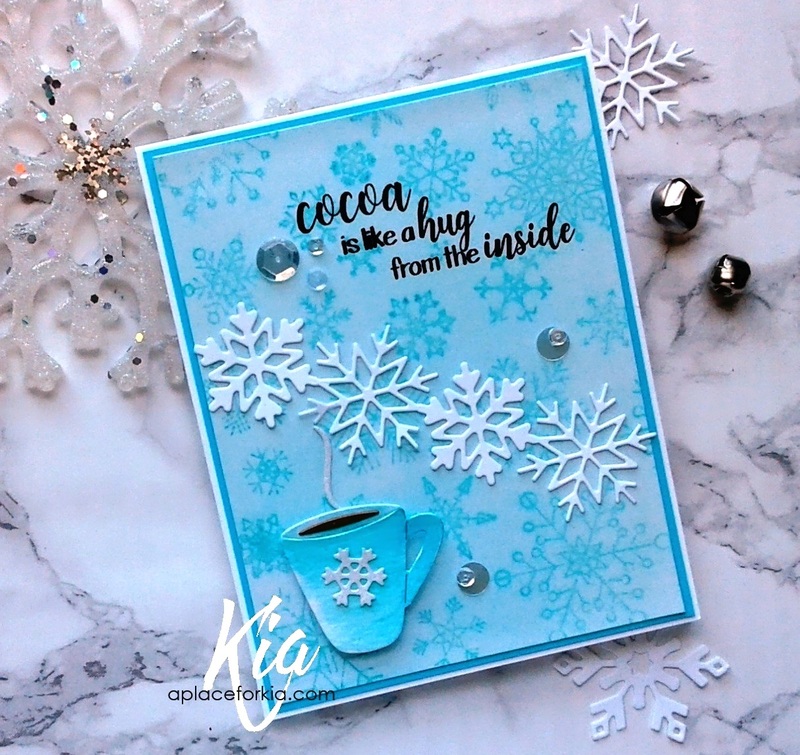 Products: Penny Black Winter Wonderland Stamp Set, Frantic Stamper Birch Tree Forest Die Set, Simon Says Stamp Stitched Circles, Neenah Cardstock, Fabriano Hot Press Watercolour Paper, Zig Clean Colour Brushes, Ranger Archival Coffee Ink, Altenew Parrot Ink, Sequins, Foam Dots. 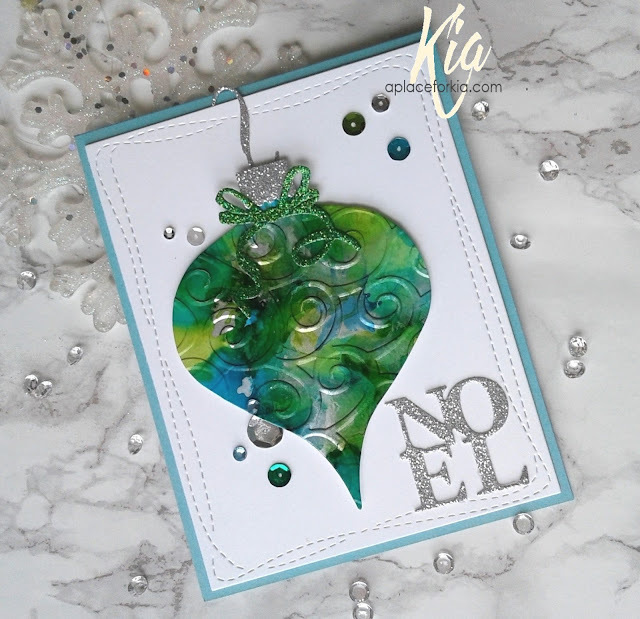 I love the look of ornaments done with alcohol ink, especially using the reds as I have done here. 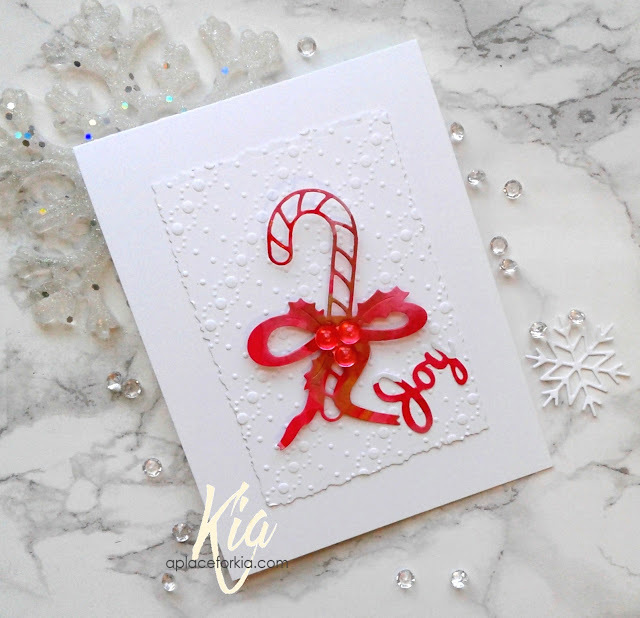 I previously made this card with a red ornament, so I had to make this a bit different, which I attached directly to my card base on foam tape. 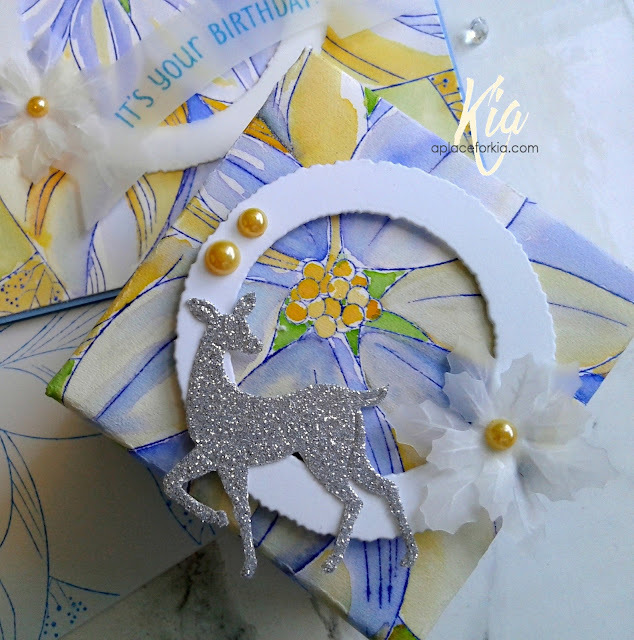 I added the village, which is coloured with gold Wink of Stella, and changed the ornament cap from glitter to metallic, and this time I did not add the bow. 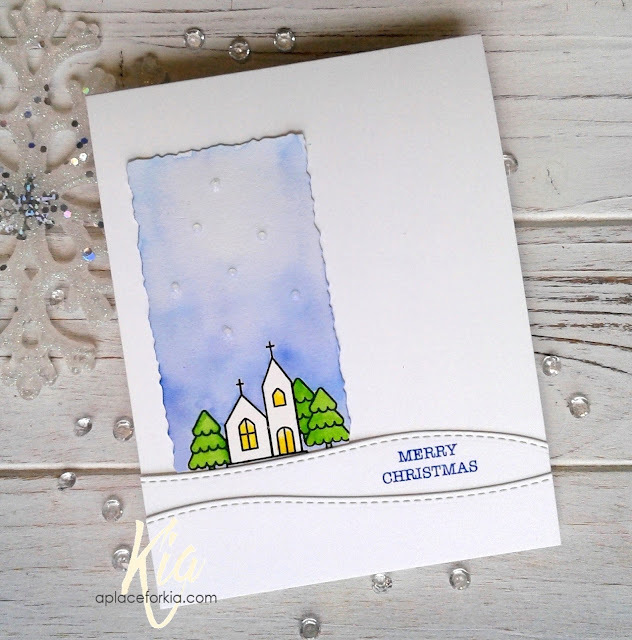 In the background I stencilled on falling snow with embossing paste and changed up the sentiment, finishing with sequins. 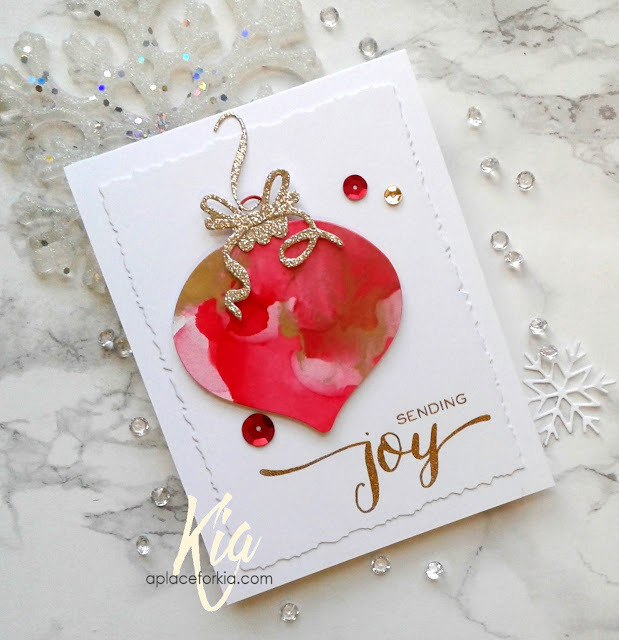 Products: Frantic Stamper Finial Ornament Background, Papermania Christmas Stamp Set, Simon Says Stamp Snow Drops Stencil, Alcohol Inks, Yupo, Neenah Cardstock, Gold Metallic Cardstock, Ranger Archival Vermilion Ink, Embossing Paste, Sequins. Now that I have handed out these cards I can share them with you. 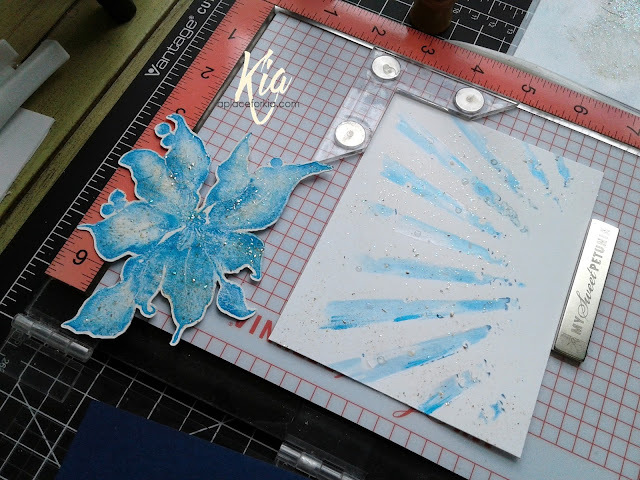 To start this card I first die cut a panel of watercolour paper using my wonky rectangles. 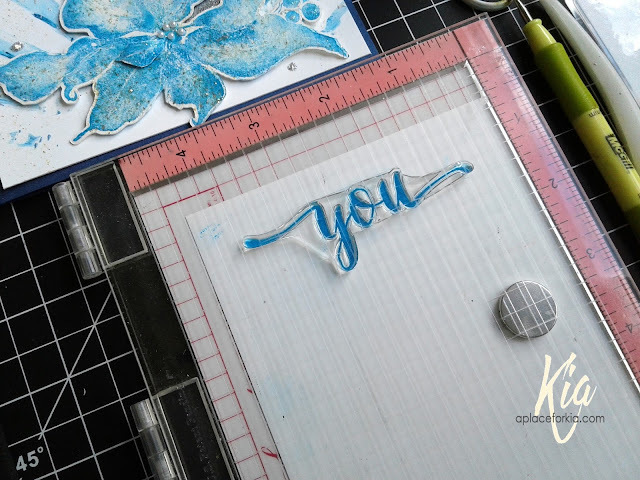 As I want to get more mileage from my embossing folders, and even though this is a 6x6 folder, I embossed only part of my card panel, then did a wash over the embossed area. 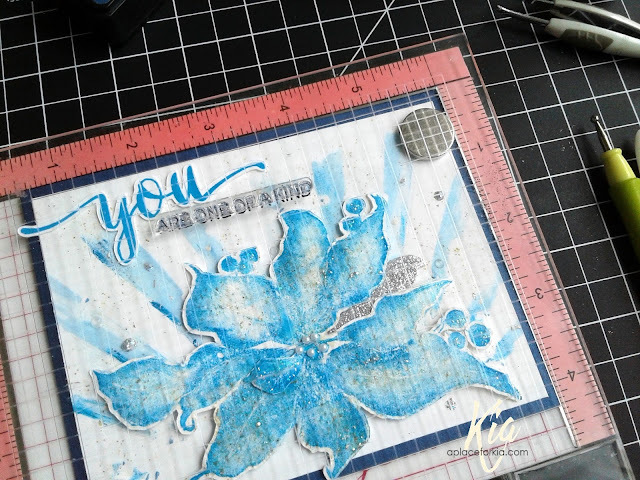 While that was drying I heat embossed using black embossing powder the Joy sentiment, and yes I measured this before I started the card to ensure I would have just enough room for my sentiment. I cut a narrow piece of silver glitter cardstock and attached where the watercolour and embossing ended, then attached the panel on foam tape to my card base. 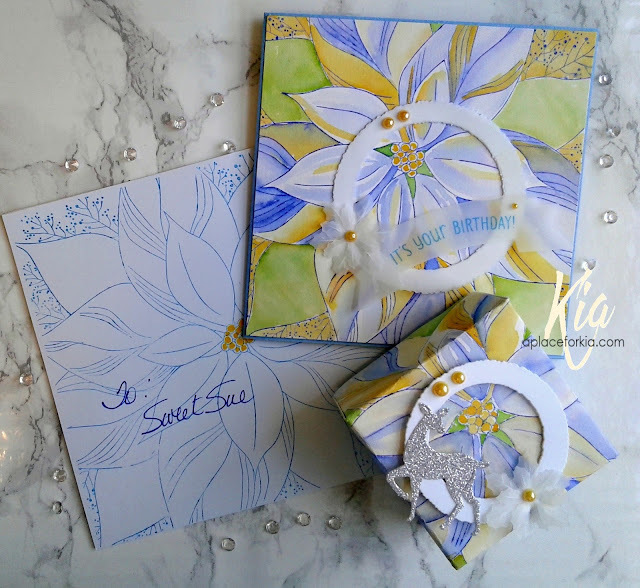 Previously I embossed pieces of both watercolour paper and cardstock to use for die cutting. 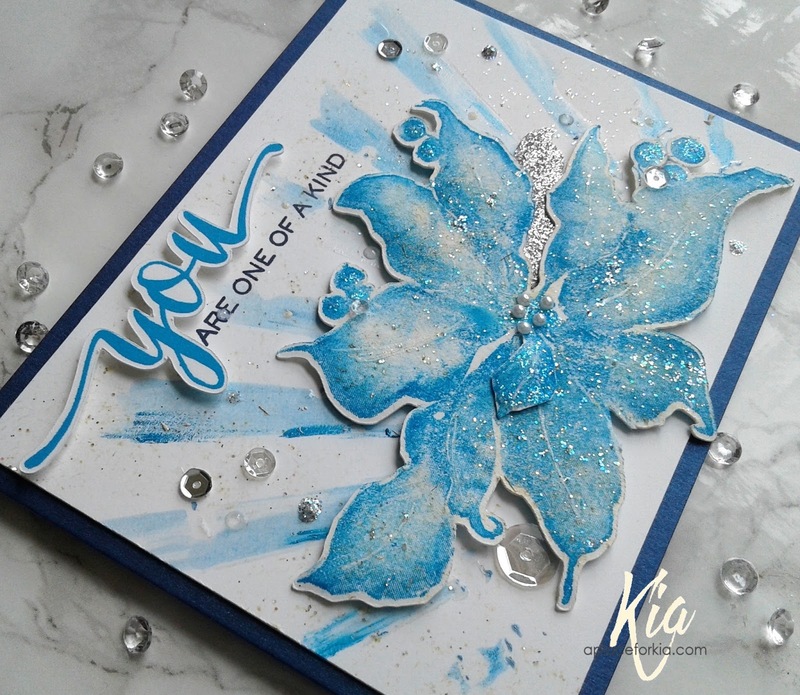 This snowflake is one of those pieces in the watercolour paper. 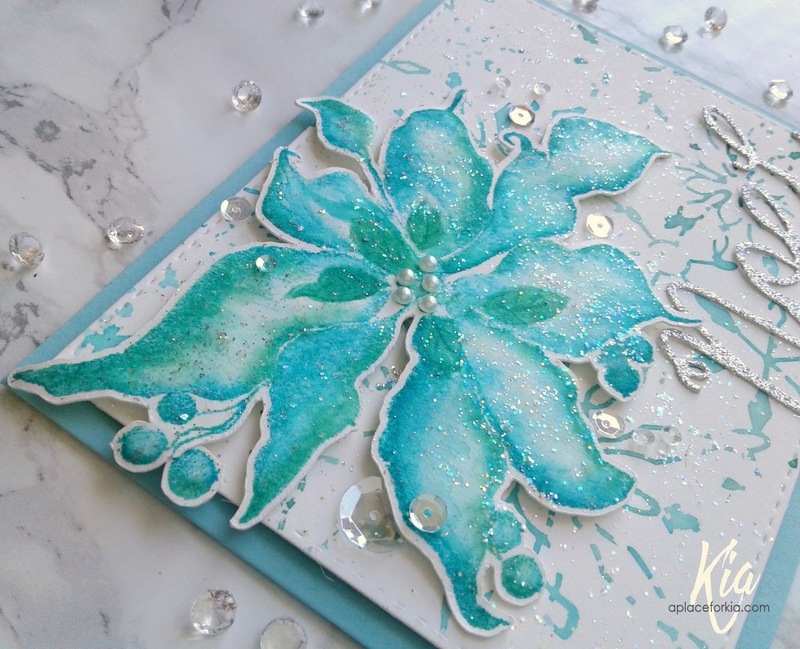 A few sequins finished my card. Thank you for visiting ... see you next time. Products: Crafter's Companion Vintage Snow Bells Embossing Folder, Simon Says Stamp Funky Snowflake Die, WPlus9 Hand Lettered Holiday Sentiment Stamp Set, Neenah Cardstock, Fabriano Hot Press Watercolour Paper, Silver Glitter Cardstock, Schmincke Cobalt Turquoise Watercolour, VersaMark Embossing Ink, Black Embossing Powder, Foam Tape, Sequins. Getting those last minute Christmas cards done today. I had yet to use this green glitter cardstock, or the green metallic cardstock, so they were combined for this card. 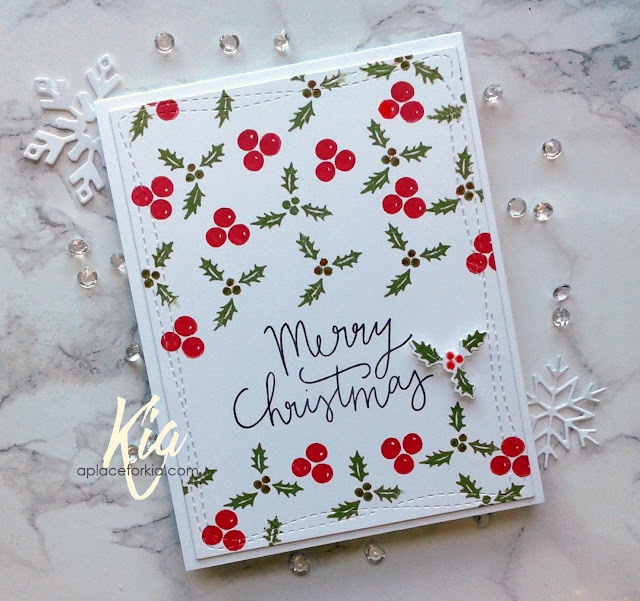 The background is die cut with the wonky rectangle die and embossed with my snow drops embossing folder. I die cut another piece using the rectangles as well as a landscape die for the snow and a place to stamp my sentiment. It is attached on foam tape, and the die cut tree tucked slightly behind. I finished with a few sequins. A very quick yet pretty card. Products: Marianne Creatables Christmas Tree, Mama Elephant Landscape Trio, Simon Says Stamp Wonky Border Rectangles, Sizzix Snow Drops Embossing Folder, Penny Black Believe Stamp Set, Neenah Cardstock, Metallic Cardstock, Glitter Cardstock, Foam Tape, Sequins. This is a good-bye flip book that I did for a friend. Her boss (Property Manager) is leaving the company after many years, and as there are too many signatures from employees for a card, my friend had them write their thoughts on paper that could be included in this flip book. Such a nice idea. I used Neenah 110lb card stock for the cover, buildings and sentiment so it will stand up to the handling. To start, I stencilled the Sunray with Cracked Pistachio Distress Oxide ink to get that look only Oxides can produce. 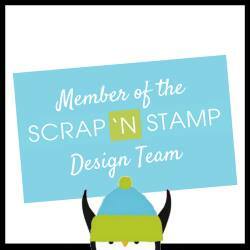 For my buildings I used Frantic Stamper's Cityscape die and cut the rows so their positions would stagger. I coloured the middle row using my distress marker in the Cracked Pistachio Distress, adding a few layers to achieve more depth of colour. 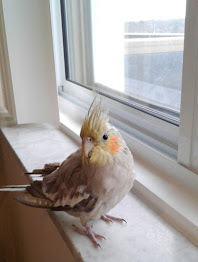 I coloured the windows with my Zig Brush in a bright yellow. To put the cover together, I attached the back row directly to the cover. For the middle row I added foam tape, and for the front row I added two layers of foam tape. Doing this created shadows from the other buildings ... much like what happens in large cities. 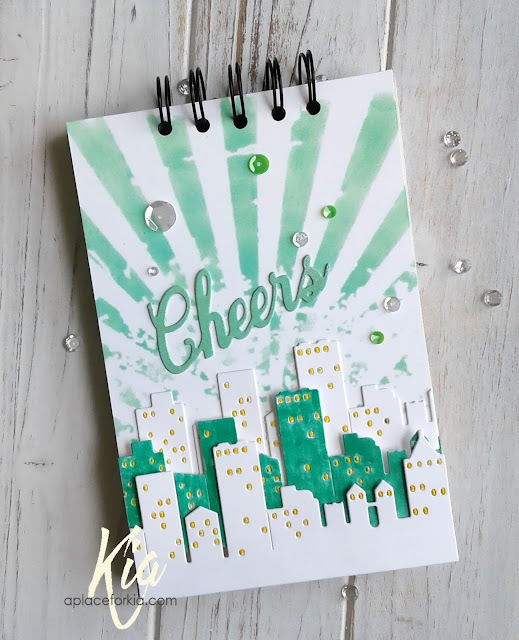 Products: Frantic Stamper Cityscape Die, Frantic Stamper Champagne Glass & Cheers Set, Tim Holtz Rays Stencil, Neenah Cardstock, Tim Holtz Cracked Pistachio Distress Oxide Ink, Tim Holtz Cracked Pistachio Distress Ink, Tim Holtz Cracked Pistachio Marker, Wink of Stella, Foam Tape, Sequins, Coil. I needed to do a Christmas card for my bird's veterinarian, and I could not resist painting up this stamp image from Your Next Stamp. They are too cute with their Santa Hats. I first die cut my panel with the wonky rectangles and the arch dies, then stamped my sentiment in the paradise teal. I aligned the panel to my base so I could mask the area I wanted the stencil the snow in. Once dry I attached the panel on foam tape. 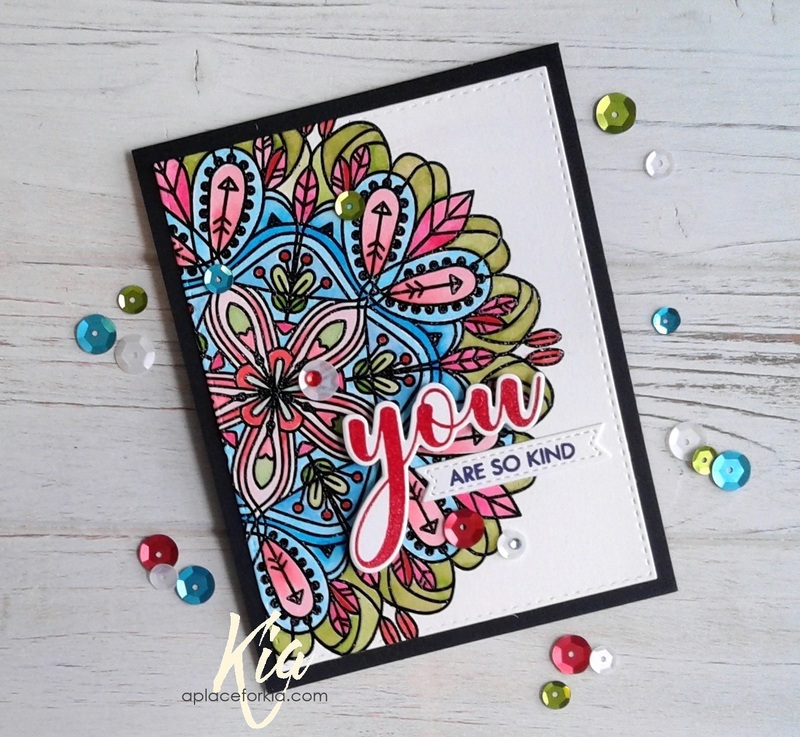 For the birds, I stamped using intense black ink and water coloured using Zig Clean Colour Brushes, adding Wink of Stella to the hat, then die cut the piece with the matching die and attached inside the arch on foam dots and finished with a few clear sequins. Santa is excited .... he will be visiting us soon! 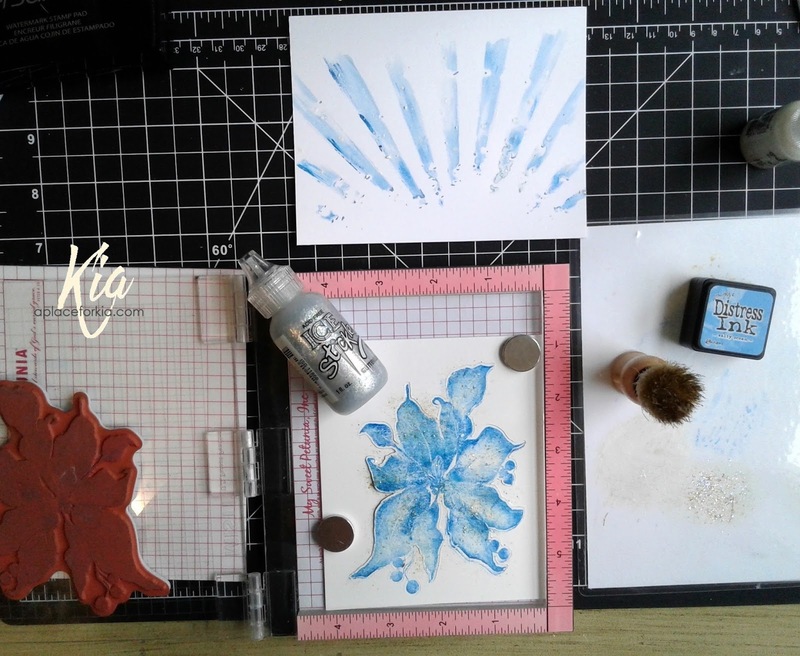 This is my sample for the Clean and Simple challenge at Splitcoaststampers today, which is to use zigzags on your cards. I first die cut my panel piece using deckled rectangles, then embossed with with the zigzag embossing folder to meet the challenge, but turned it for a change and propped it up on foam tape. 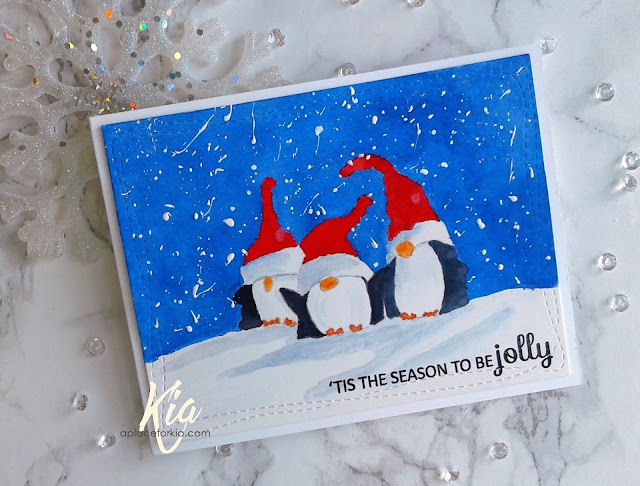 Santa is stamped on watercolour paper and painted with Zig brushes, and attached on foam dots. I die cut the be jolly sentiment in silver glitter cardstock, and added the star, which was already on my desk from another project. 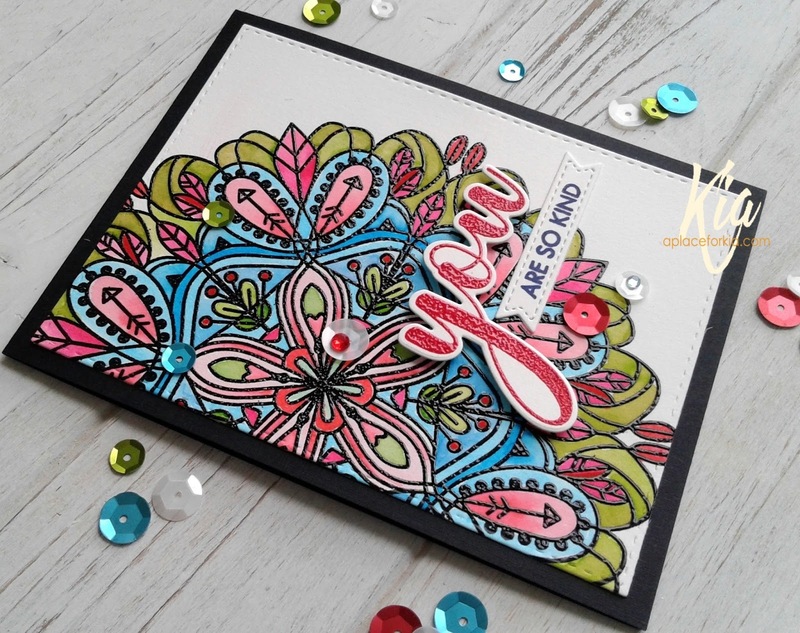 A few sequins finished my card for today. Thanks very much for visiting ... see you next time. 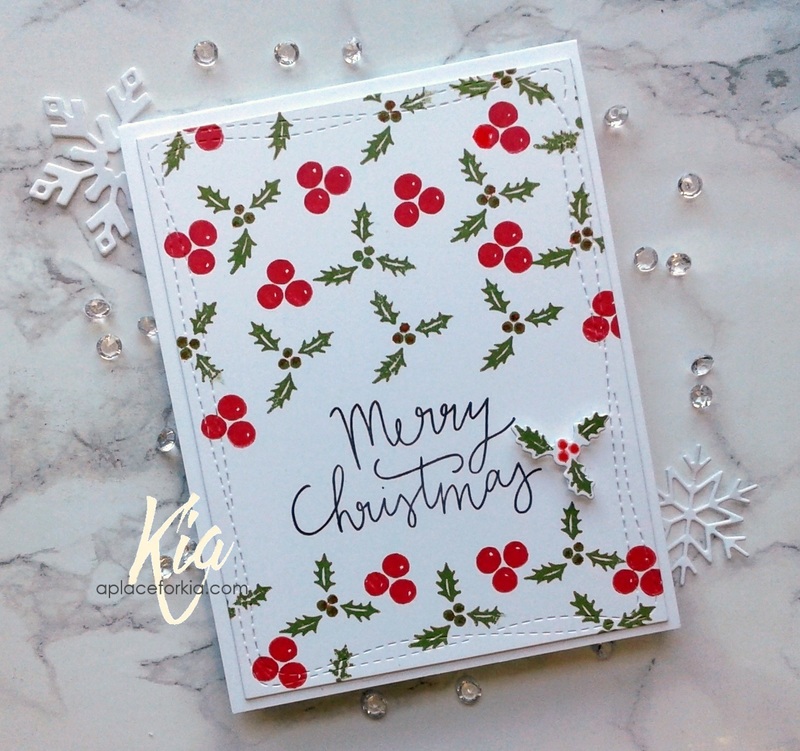 Products: My Favorite Things Jingle All the Way, Frantic Stamper Deckled Rectangles, Darice Chevron Embossing Folder, Stamploration/CutPlorations Be Jolly Die, Neenah Cardstock, Fabriano Hot Press Watercolour Paper, Zig Clean Colour Brushes, Sequins, Foam Tape and Dots. 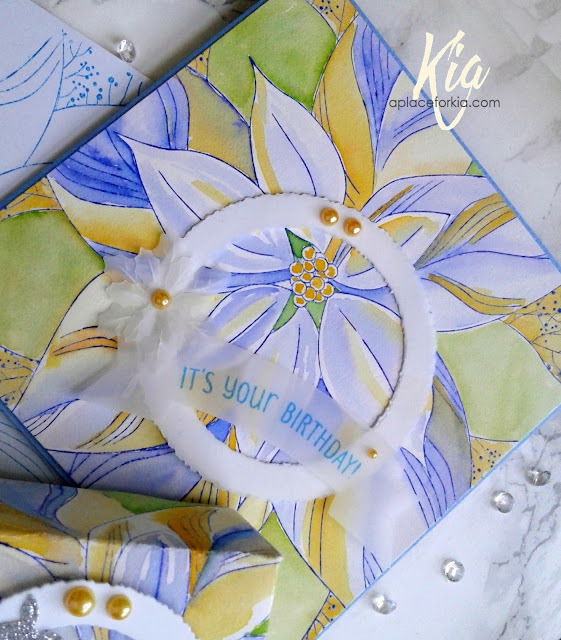 A card similar but different from the card that I did for Iliana earlier this week. I like every card I do to be unique. 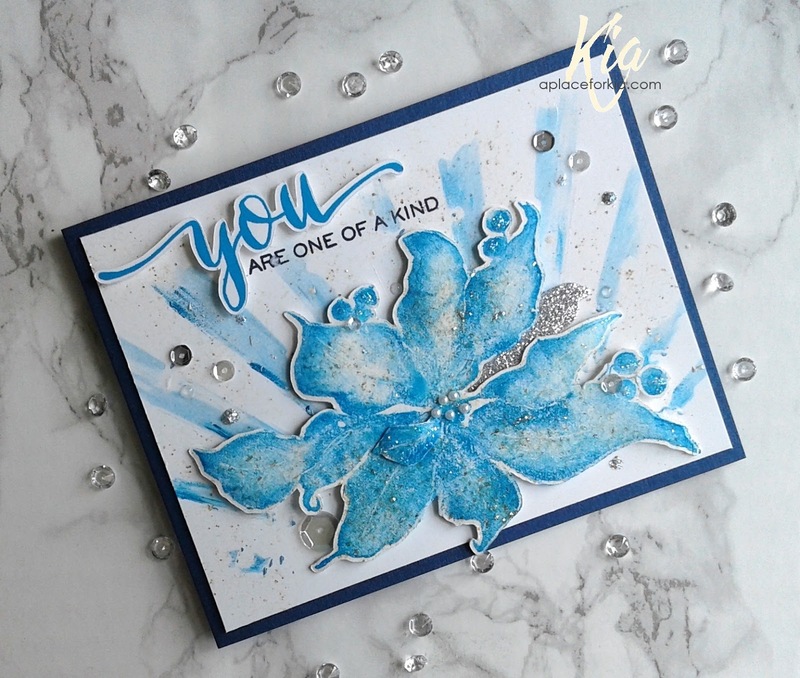 I was asked how I did the card, so today at the end of this post I am also including a video for those who are interested. Here is a close-up of this card detailing the sparkle and the layers of colour. The background panel is a stencil mono-print. I have a link for this technique in my Awesome Tutorials section above. 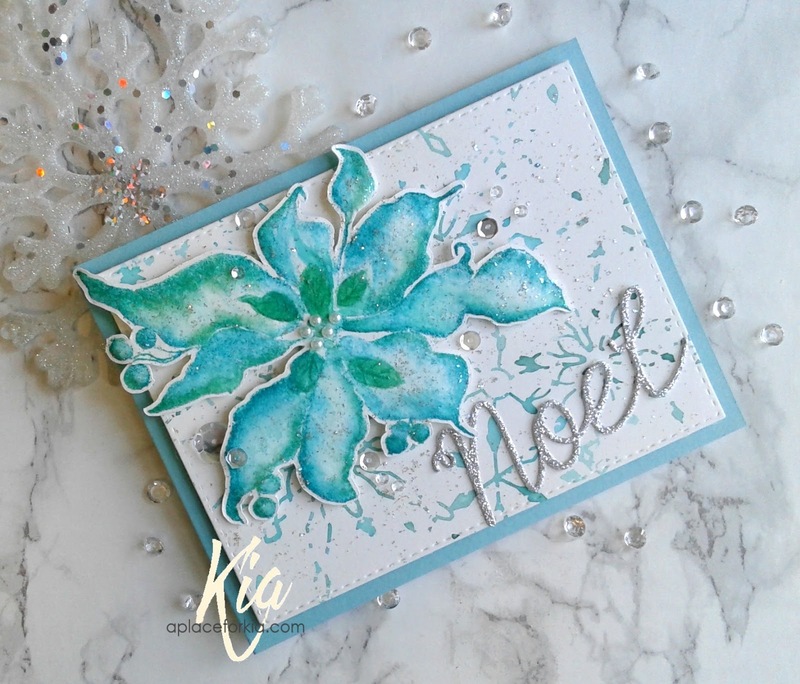 I used watercolour paper for the background and the poinsettia, which I did by laying down layers of colour. 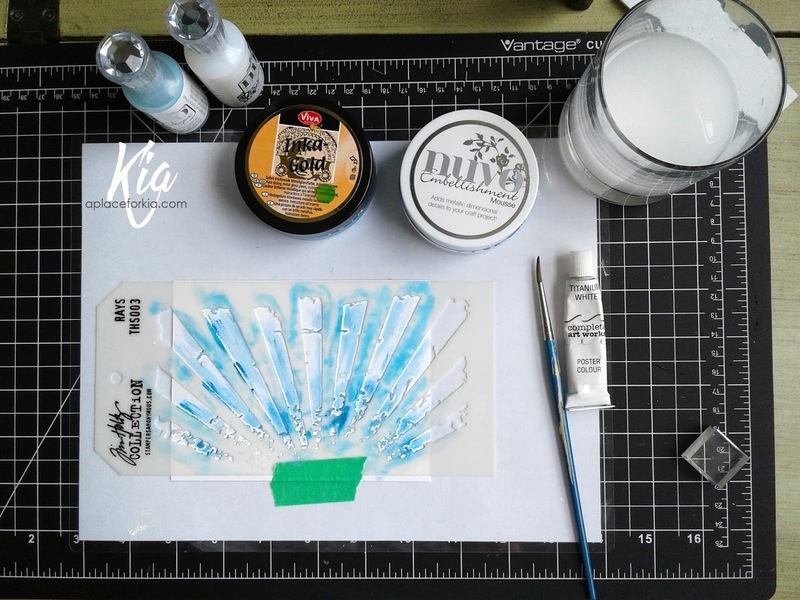 In order to do this technique a Misti is a must and you will see why in the video. Thank you for visiting today. I hope you enjoy the video. Being new to doing them I can say I have much to learn, and I appreciate your support. Products: MISTI, Penny Black Scarlet Majesty Stamp, Frantic Stamper Layering Noel, Memory Box Snowflake Flurries Stencil, Simon Says Stamp Stitched Rectangles, ScanNCut, Tim Holtz Distress Inks Evergreen Bough, Pine Needles, Peacock Feathers, Lucky Clover, Cracked Pistachio, Aura Cardstock, Fabriano Hot Press Cardstock, Silver Glitter Cardstock, Ice Stickles, Sequins, Kaiser Pearls, Foam Tape and Dots. At art class on Wednesday past we did this scene in a larger version. I so wanted to do a card, and today is the day. I used my Mini Misti and magnets to hold my watercolour paper while I painted. It makes it so easy and no messing around with tape. Once dry I die cut the finished piece with my sentiment and the Wonky Border Rectangle die. I painted the scene using a mix of Daniel Smith and Schminke watercolours, doing the night sky first. I covered up the penguins to splatter the acrylic paint on the night sky, then finished painting the scene. 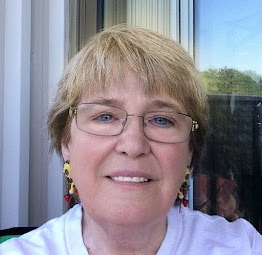 I think it is so cute .... and am truly grateful for my wonderful teacher Colleen. And a reminder that the sale continues at My Sweet Petunia. 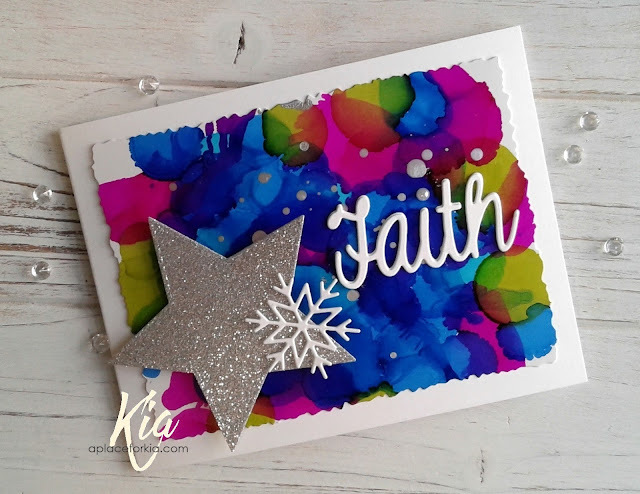 Products: Neenah Cardstock, Fabriano Hot Press Watercolour Paper, Simon Says Stamp Wonky Border Rectangle Die Set, Clearly Besotted Little Llama Stamp Set for sentiment, Daniel Smith and Schminke Watercolour Paints, Acrylic White Paint.